Flavour combinations are the key to this dish. Combined with a mix of KNORR Aromat, paprika, garlic and lemon complements perfectly with the lamb. Clean and remove the excess fat off the lamb fillets and thread lengthways onto the skewers. Combine the paprika, garlic, lemon rind, KNORR Aromat, pepper and oil and add to the lamb fillets, allow to marinate over night. Wash and peel the sweet potato, peel strips off the potato and lightly fry in preheated oil (140 degree Celsius) until crispy. Remove and drain on paper to remove excess oil. 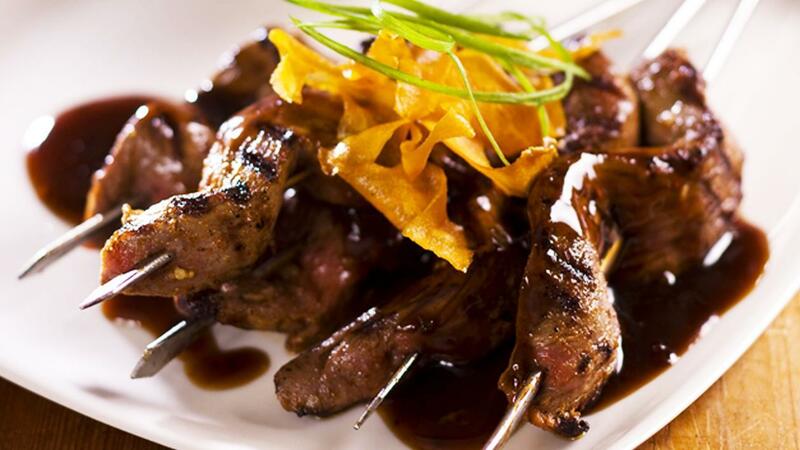 Preheat a large char grill and cook the marinated lamb skewers to desired liking and place onto a plate, add the heatedKNORR Sakims Mongolian Sauce and garnish with the cooked sweet potato chips and chopped spring onions.